I am new to the forum, here goes I had a waterfall scrubber in my sump and was brilliant, but I can no longer have a sump for reasons I am not getting into right now. So the water fall scrubber has gone and ever since I have had big hair algae issues, please note I have been trying to get my DIY up flow scrubber to work. I am hoping that I have finally succeeded and thought I would share my progress as I go. I first used interpret LEDs for the up flow scrubber along with two air stones 1 behind and 1 in front of the scrubber and they did grow a little hair algae but not much, I cannot hay any DIY lighting and have to have at least splash proof lighting so I now have purchased an tmc mini led 400 tile. I know it should be 660nm lights but again I cannot DIY them and have not found any out the box 660nm lights. 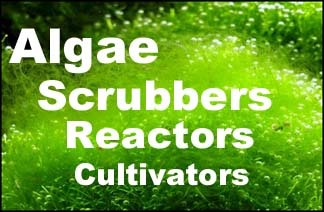 Here is some pics, algae scrubber taken on day 3. Bubbles look good. The light is white? I have to use something that is splash proof, don't want any house hold stuff with bulbs etc, we run a child care business from home so the safer the better and I have had a nightmare looking for a purpose built 660nm light unit. However did come across this light unit (£50) which uses 4 x Cree 3 watt 6500k (yellow) lights, so fingers crossed. If you know somewhere I can get said light unit then I would greatly appreciate it. I am hoping to add a metal grill over the heat sink tomorrow, I will share pics of the finished product. Last edited by rcracer20071; 11-13-2014 at 05:11 PM. Heat sink should not get too hot. I am curious that I have a clear patch in the middle where the air bubbles are flowing up, anyone had this before? Please note that I am using air stones so small bubbles. That's where the light is closest. Is this a sign that the light is too close, or should it fill in? It is too focused for the screen size, yes. Need to be spread out more, but, as the screen fills in, it might be ok. Try putting a 1" circle of cloth on the glass in the middle, to shade it for a while. Thanks for the help, I've just built a new version of it as I have read it is better to have bigger bubbles. Also sorted some other issues, if the bald patch happens again I will make a shaded area like you said. Main tank lights 5 hours a day. 15Watt 2300k bulb 1200 lumens running 18 hours a day. I now have proper white cross stitch mess really rough. Cleaning scrubber once every week. I cleaned the scrubber last night so I shall start posting pics to show you what is going on, please note the hair algae showing is from me attacking the hair algae in the main display that has come loose and ended up in the scrubber. All ideas welcome at this stage.